Our big, beautiful, seven-year-old German Shepherd Otto is dying. We learned this in November when he went to the vet due to excessive drinking and urinating. All the tests we ran showed very little was wrong, except his ability to concentrate urine. Otto’s kidneys are failing. To look at him then and even now, you would think nothing was wrong. He seems healthy and active. He eats well and looks in great condition. But something is very wrong. In early December his first morning urine specific gravity was 1.030. The normal range is 1.050-1.060. The vet said at that time his kidney function was at about 25%. Since then we put him on a low protein, low sodium diet. There is very little else to be done for failing kidneys. He loves his new diet that includes lots of vegetables and senior moist food mixed with dry senior kibble. It took some searching to find a diet that didn’t aggravate Otto’s chicken allergy. After a few weeks he stopped drinking and urinating excessively. We actually thought the urine test was a fluke and he might be getting better. I got a veterinary refractometer so I could test his urine specific gravity at home. Five days ago I checked his first morning urine and the specific gravity reading is down to 1.010. The only indication of anything being wrong is that he occasionally vomits a little. Otherwise he seems perfectly healthy. Kidney failure for Otto is an insidious process. The vet has no real explanation for the failure. Otto could have gotten into poison, destroying the nephron cells in his kidneys. These cells do not grow back once they are killed. We have no idea where the dog could have gotten poison. He doesn’t stray far from us. The other dog, Max, goes everywhere with him. Max does not have any problem. 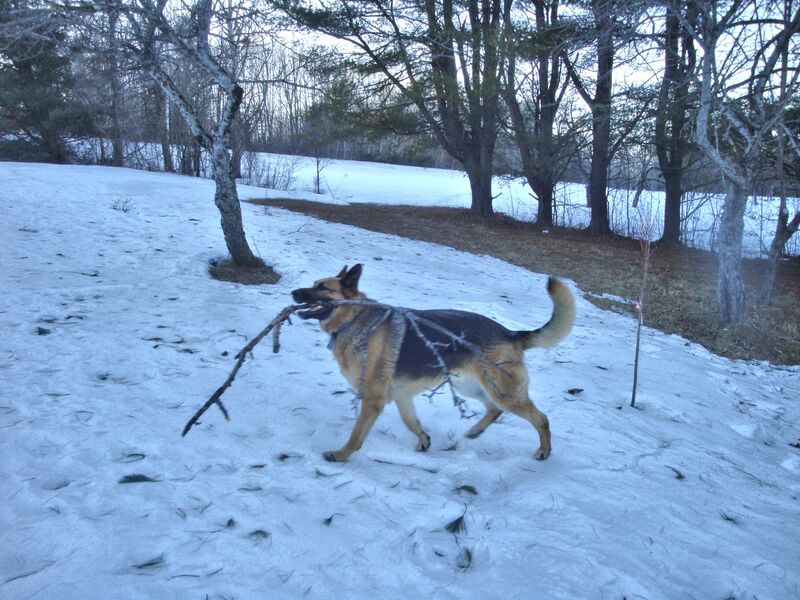 There is a condition found in German Shepherds called chronic kidney failure. It is a genetic issue. We don’t know if this runs in Otto’s family. The breeder certainly didn’t mention it when we bought him. I suspect this may be what is causing Otto’s demise. I plan to start administering subcutaneous fluids to help keep Otto hydrated in an effort to extend his life. Once his kidneys reach a critical stage, Otto’s health will rapidly decline and we will be forced to lay him away so he doesn’t suffer. It would be good if he could make it to spring so we can bury him in our pet cemetery. It will be a very sad time on the farm. Feb 2 Update: Since writing this blog two days ago, I’ve had more discussion with the vet. He was interested to learn that Otto’s urine dilution had increased while his drinking and urination had decreased to nearly normal. Although Otto does not show any other real symptoms, the vet wants to check the dog for Addison’s disease. So in two days Otto will get an ACTH stimulation test. Fingers crossed that he has Addisons, the first time I’ve wished a disease on a dog. Because it is treatable with steroids and he could have a long, regular life, instead of succumbing to kidney failure. Feb 6 Update: The ACTH Stim test was performed yesterday and the results came back completely normal. For $300+ we learned Otto does not have Addisons disease. Still no idea what is wrong. Today we are performing a urine concentration test. No water for Otto for most of the day and every few hours I collect urine and test the concentration with my refractometer. So far his urine continues very dilute. Most owners know that their cats are obligate carnivores. This means feline bodies do not produce all the essential amino acids for survival. Cats must consume meat to obtain taurine or they will die. Taurine deficiency can result in various conditions including blindness, tooth decay, enlarged heart and lowered immune response. For most of their evolutionary past, cats were busy little rodent killers. They earned a place beside man’s hearth by keeping the mice and rats under control. Consuming rodents and other small animals provides cats with the taurine they need. While the modern house kitty may catch and even eat the occasional mouse, most cats subsist on commercial diets. These are supposed to be balanced foods that meet the nutritional needs of felines. Unfortunately, far too many house cats are overweight. I worked for eleven years as a veterinary technician and saw an inordinate number of over-weight kitties. In the photo above of my own cats, the cat at the bottom, Toby, is quite hefty. He started out at an optimal weight and body condition and stayed there the first seven years of his life. His weight gain started when he developed bladder infections and began receiving moist food every evening. Because I have a multi-cat household, I always have dry food available free-choice and Toby really pigged out. He is a large-framed cat anyway. With the extra weight, he topped the scales at nearly 19 pounds. Over the years I’ve owned many cats. Most were within fairly normal weight ranges with a few exceptions. Some just ballooned to overweight as they reached senior age, about 7 years old. Perhaps the gain was due to lower activity levels. Or maybe something else is going on? A review of the guaranteed analysis of the nutritional content of commercial cat food reveals that most dry food provides about 0.1% to 0.2% taurine. This includes many high end brand names and even prescription diets. Moist cat food has a taurine content of about 0.05-0.2% with more expensive brands generally having more of the amino acid. Semi-moist cat foods are in the same boat. Sometimes the taurine levels in cat food are not even provided on the package. The consumer must make an effort to find the information. Taurine is highly water soluble. It is not possible to over-feed taurine since excess is excreted. Most cat food is supplemented with taurine due to a significant loss of the amino acid during the cooking process. Studies indicate the average cat requires 75-100 mg of taurine per day. Experiences with my own cats leads me to suspect the requirement is actually higher. For most of Toby’s adult life, he ate only Purina Complete Cat Chow, a dry food. This was available free choice. Then at age seven he also started getting 1/2 can of moist Friskies pate per day. The taurine content of Cat Chow is 0.15% and Friskies canned is 0.05%. Within a few months the cat’s weight gain was obvious. It just got worse and worse. At 16 he was that very heavy cat in the photo. He also had serious problems with chronic yeast ear infections. One of my dogs had very itchy skin with chronic yeast in the ears. After he was switched to a non-chicken diet, his itching and grungy ears all went away. He had a chicken allergy. I wondered if my cat had the same problem. Chicken is a cheap and easily obtained protein that crops up in a majority of commercial pet foods. During my search for a dry cat food without chicken, I stumbled across Farmina Natural and Delicious. Beginning in mid-January of 2018 (about one year ago) I changed all my cats to dry Farmina and also cut out as much chicken as possible from the moist food I offer every night. I also feed about 20% Science Diet Dental Care (a dry food with a large kibble size to encourage chewing) to help keep the cats’ teeth clear of tartar. This food contains chicken. We’ve tried to go without Dental Care, but the tartar tends to build up. Within a few months of the food change, Toby’s ear infections cleared up. No more scratching at his ears, no more heavy build-up of dark, thick waxy discharge. He was a happy cat. The small amount of chicken in the Dental Care didn’t seem to affect him. Then I began to notice another change. He was losing some weight. Another of my cats, Chloe, a female of 5 to 6 years, also had lost some weight. She had been getting too chunky around the middle. Now she looked great! One of my younger cats, Kai, a three-year-old, had been gaining weight and losing the tucked-in waistline of his younger days. On the new diet he had slimmed down. All my cats’ coats were looking more sleek and shiny with less shedding and they seemed to have more energy. What was going on here? I studied the Farmina label and discovered it contained 0.4% taurine, almost four times the level found in most cat food brands. The cats were consuming less food, lowering their caloric intake. My hypothesis is that cats over-consume and gain weight in an effort to ingest sufficient quantities of taurine. 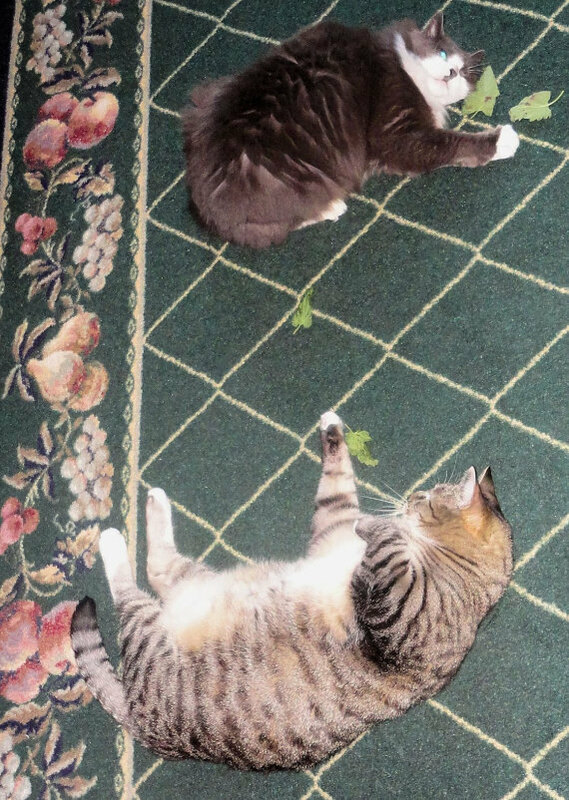 With lowered food intake, all my overweight cats reduced their weight. Today Toby is about 15 lbs and actually has a waist! In June of this year we acquired two tiny kittens. They have grown up eating only free-choice Farmina, moist Friskies pate and Dental Care. They have the most exquisite, silky, shiny coats and amazing muscle tone. Their little arm muscles fairly bulge! These kittens have great body condition, as do all the other cats in the house. At age 18, even though Toby has arthritic hips, he is active and often playful. I believe he is feeling much better than before his new diet. I wonder if other owners of over-weight cats tried increasing taurine levels that they would discover the same results? It’s worth a try! Disclaimer: I do not recommend any particular brand of cat food, do not make endorsements, and have not received benefits or consideration from any cat food manufacturer.